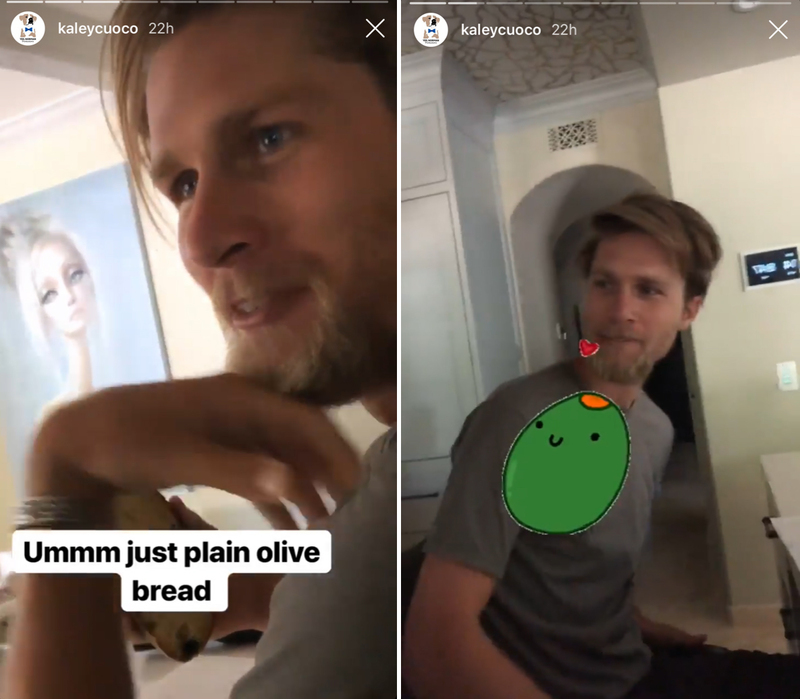 Kaley Cuoco may be head-over-heels in love with her husband, Karl Cook, but the professional equestrian has (at least) one eating habit she just can’t stand. As the Big Bang Theory star explained via a series of posts on Instagram Stories on Sunday, April 14, her beloved likes to munch on olive bread – a loaf of bread with olives baked into it – for breakfast. “BUT WHY?,” the 33-year-old wrote in big, bold letters over a video clip of her husband snacking on the savory food. “I love olive bread,” Cook, 28, retorted. “Because it’s amazing,” Cook whispered back. 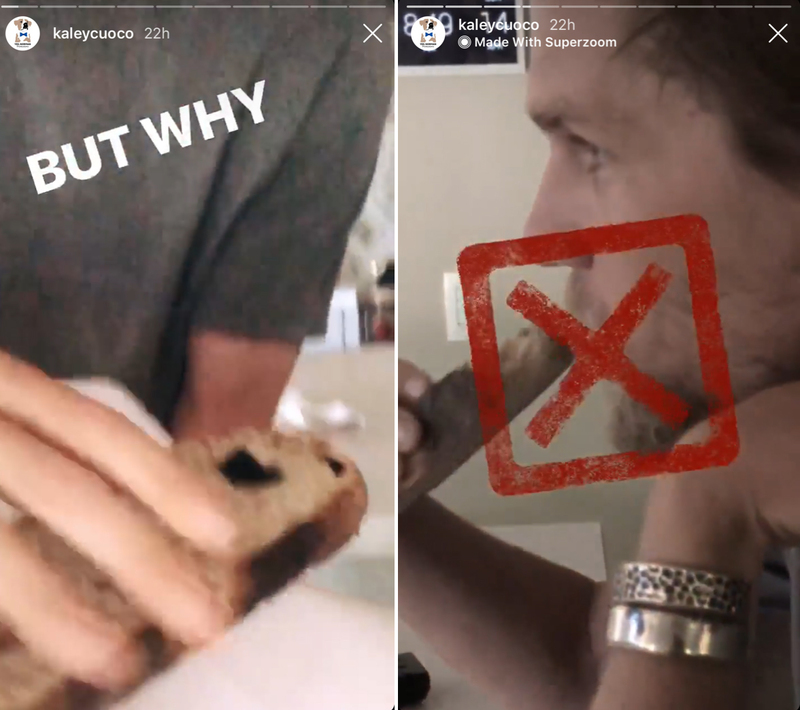 Though the 8 Simple Rules alum included an olive love emoji in her Story, she still couldn’t bring herself to support her husband’s breakfast food of choice. “That is so gross,” she stated. In a final attempt to show her disapproval of Cook’s early-morning meal, the Yes, Norman Productions founder shared a clip of Cook eating the food and put a bright red “X” through it. Clearly she’s not a fan, and likely never will be. Making fun of one another for their eating habits is a bit of an LOL-worthy habit in the Cook-Cuoco household. Back in July 2018, just days after they tied the knot in California, Cook captured footage of his new wife expressing her true feelings for Oreo cookies. Cuoco, who was recovering from shoulder surgery at the time, was filmed by her husband holding a package Golden Double Stuf Oreos and kissing it for several seconds while watching The Bachelorette. “I cannot get over how good these are,” she said of the sweet treats at the time. The SAG nominee then gestured to the television, where Becca Kufrin was in the midst of an embrace with one of her bachelors, and added, “I feel like that, about these,” before grabbing the Golden Oreo package and passionately kissing it. Hey, at least these two can laugh at one another!